Today I visited great meetup by the author of Hooked. Here is my sketchnote. 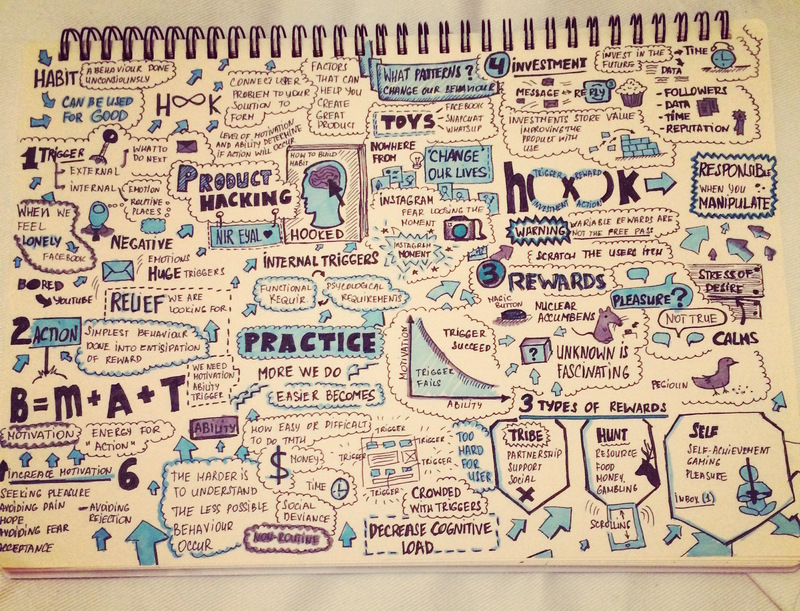 It was my first experience of “live” sketchnoting. Spent about 15 min finalizing it at home with colours. very good. but too many things involved , i took time to connect every thing. i would definitely want to have this at my desk . thank you) I am doing that for myself only – it helps me to remember information better. Also it is a kind of “meditation” for me) That is why it is difficult for others to understand sketchnote – it is created for memorizing, not for presentation. Sketchnotes are wonderful tool for almost everything. I came across Sketchnote workbook (http://rohdesign.com/workbook) some time ago and got obsessed with them. Found out that I remember things easier when write/draw them. Hey Galina, can I use this absolutely beautiful image as a blog post header about habit hacking? I’ll give you credit of course.